... is this Honda with a touring trailer which holds up to 200 or 300 pounds of clothing at a total cost of $10,000. Sonny and Ann Rollo from Tallahassee don't have to overload on their tours. 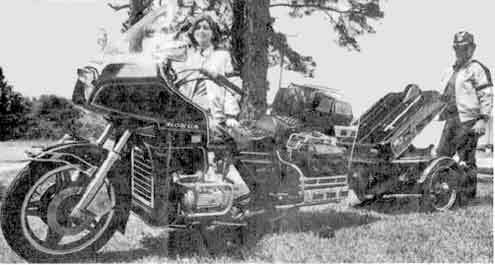 When Sonny and Ann Rollo helped start the Chapter in early 1982, a Gold Wing cost a whopping $2,500 to $7,500, or up to $8,000 with all the goodies! The Chapter began as part of Chapter Q in Panama City, and later broke off into P. C.'s Chapter L and Tallahassee's Chapter A. When Florida was split into FL1 and FL2, we became Chapter FL1-A2. As Ride Coordinator for many years, Sonny led us on many rides throughout the years to interesting tucked-away places such as Lunker Lodge, Steinhatchee, Cedar Key, and many more. You can bet he knows all the great places to eat within 200 miles!